We often think about the clean air and water that forests provide us, but do we ever sit down and imagine all the unique and wonderful ways that human beings connect with forests in deeply personal ways? Dogwood Alliance took up that challenge. We’ve searched across the Southeast for stories about individual relationships to the forest. Our minds were blown by all the awe-inspiring and unexpected stories we’ve collected so far! Some are beautiful. Some are funny. Some are tear-jerkers. We wanted to share those stories with our Dogwood community and with the world, so we created the Stories Happen in Forests video series. We joined Cortina Jenelle Caldwell at Earthaven Ecovillage in Black Mountain, NC. Cortina shared her love of community and the diversity of the forest. Noah Davis shares his heartrending story about how he overcame addiction through his connection to the forest. In a very real way, the woods saved Noah’s life. 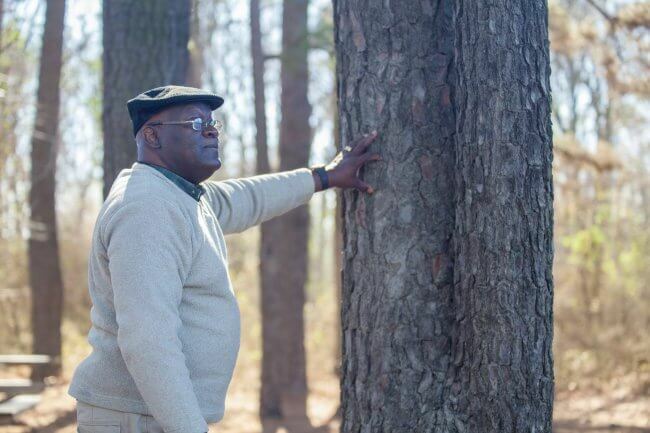 We sat down with James Woodley, and he told us about how he finds healing and strength in the woods. His story rarely leaves a dry eye. We went down to Florida to meet up with forest warrior Ruddy of Global Justice Ecology Project & Everglades Earth First. Ruddy shared with us how she protects forests from treetops. We were very fortunate to capture the story of celebrity John Darnielle, singer and songerwriter for the The Mountain Goats. John told us a story about a surprise encounter he had while kayaking down the Alligator River. We hope these stories move you as they’ve moved us. We hope that you’ll consider joining our Forest Defenders monthly giving program. As a Forest Defender you’ll be the backbone of the forest protection movement, and your gifts will go towards making sure that stories like these, for me and you and others, can keep happening in forests.